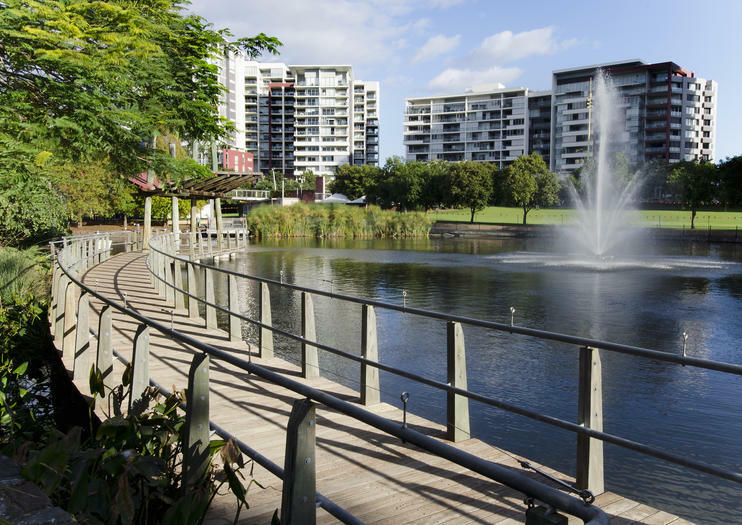 On a hill overlooking Brisbane City, you will find a sprawling garden oasis known as Roma Street Parkland. This subtropical parkland boasts bamboo thickets, sunny picnic patches, calming waterways and meandering paths through botanical bliss. The happy result is an inner-city retreat that can whisk you into another world, despite being only a few minutes’ walk from the central bustling business district and Brisbane Transit Centre. Designed and realised by Australian gardening celebrity, the late Colin Campbell of the ABC’s Gardening Australia, Roma Street Parkland was established in 2001 as a horticultural wonderland, using the former goods yard for the adjacent train station. Since opening, the parkland has become a popular outdoor space, hosting entertainment events in the natural amphitheatre at the top of the park, as well as festivals and other recreational events. Free guided tours are offered to show visitors around the Australian subtropical gardens and distinct globe-inspired horticultural displays. Between Friday and Sunday, a mini train, known as the Parkland Explorer, runs from 10am to 3pm for a gold coin contribution. Zip rundt i Brisbane på en sjov, selvbalancerende Segway. Cruise forbi Brisbanes flodbredder, glide rundt om Southbank Parklands og nyd dramatisk udsigt over Kangaroo Point Cliffs. Vælg mellem en 1 eller 2-timers sightseeingtur, dag eller nat, eller vælg en Joy Ride-oplevelse i stedet og nyd maksimal ridetid for at koncentrere dig om at hive dine Segway-færdigheder. Bedst af alt: Fuld instruktion og øvelsestid er givet, og der er ingen erfaring nødvendig, så alle kan give det en chance! Denne tur er begrænset til små grupper og sikrer en personlig oplevelse, som du vil huske. Får ikke fanget på en overfyldt tourbus med rowdy turister på disse halvdagse private ture i og omkring Queensland. Vælg den tur, der interesserer dig mest - Vælg en tur rundt Brisbanes historiske vartegn og haver, et eventyr ud til den nærliggende Mt Tamborine, eller et besøg på den gyldne Guldkyst. Du kan endda tilpasse din tur: Bare fortæl rejsearrangøren hvad du er interesseret i at se, og de vil opbygge en ny tur til dig. Denne tur er for de mennesker, der er elskere af natur og haver, og som gerne vil tilbringe en dejlig eftermiddag opleve de dejlige tropiske haver i Brisbane på en privat behagelig tur med en venlig lokal guide.